My family and I spent the weekend of April 26 at the YMCA of the Rockies Estes Park Center, a rustic, 860-acre resort in Estes Park, Colorado. Estes Park Center, which sits 8,010 feet above sea level, is surrounded on three sides by the breathtakingly gorgeous Rocky Mountain National Park. Estes Park Center offers a variety of affordable lodging options, from rooms that sleep four people all the way up to cabins that sleep 88! This makes it a popular destination for family reunions and other large gatherings. 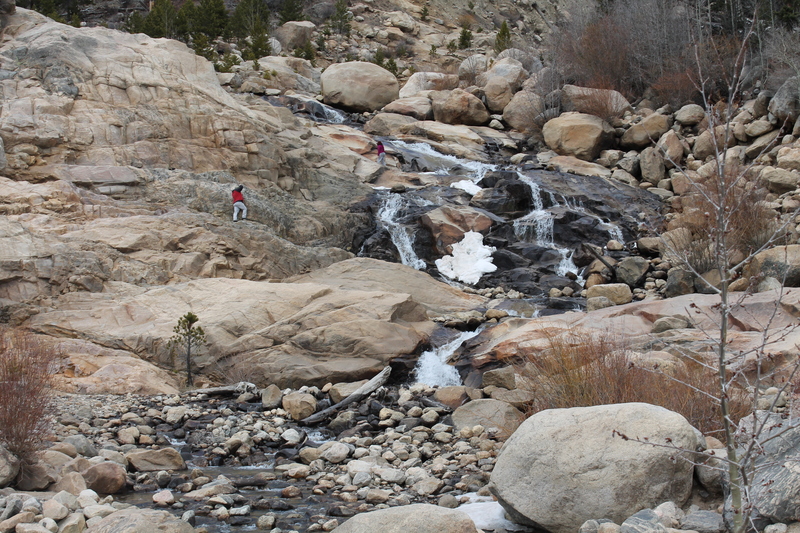 Estes Park Center also offers a plethora of activities designed to bring families closer to nature and to each other. Estes Park Center has a great military special for active-duty military families. It includes a two-night stay in a lodge room, with all meals and most activities included, for $149. (The special is also available at the YMCA’s Snow Mountain Ranch in Winter Park, Colorado.) We stayed in a room in the Emerald Mountain Lodge under this military package. Our lodge room was pretty bare-bones, with two queen beds and a small bathroom. The beds weren’t the most comfortable, and the thermostat didn’t seem to be working. It was pretty hot in there and we couldn’t cool it down. That being said, you don’t go to Estes Park Center to spend much time in your room. That’s also why none of the rooms there, except for a few of the larger cabins, have TVs. Also, at such low prices, we weren’t expecting a luxurious room. Instead, we sort of felt like we were away at sleepaway camp—a fun feeling! It took us less than 10 minutes to drive to Rocky Mountain National Park. The fee to get into the park is $20 per car for a seven-day pass. We were able to get a free annual national parks pass—which typically costs $80—because my husband is active-duty military. Score! The park includes 416 square miles of gorgeous wilderness, with a wide variety of elevations and habitats. There are at least 60 mountains higher than 12,000 feet, an array of wildlife that includes bighorn sheep and elk, lakes and streams, and a ton of hiking trails and scenic drives. My family and I went on two very different, but equally gorgeous, hikes. (My hubby and I carried the boys on our backs in Kelty Kids backpacks.) We also took some amazing drives and marveled at the views of the Rocky Mountains. On Saturday, we hiked around Bear Lake. Even though it was about 60 degrees outside, the lake was still frozen. The snow around it was so deep, we could have snowshoed it! But it was worth braving the snow to take in the beauty of Bear Lake and the mountains surrounding it. There are a ton of activities to do at Estes Park Center, and they vary by season. There’s an indoor pool with a water slide, a library, a game room, a rock-climbing wall, a zip line, and a miniature golf course. Sports include basketball, volleyball, disc golf, archery, and more. There’s horseback riding, fishing, whitewater rafting, snowshoeing, roller skating, and ice skating. There are also weekly programs for adults and kids that include Bingo, scavenger hunts, classes, and more. Unfortunately, most of those activities are geared toward older kids, not toddlers. My boys are not even two yet, so we couldn’t take advantage of most of the activities Estes Park Center has to offer. We did, however, visit the Mootz Family Craft and Design Center, which is really cool! You can make jewelry, paint ceramics and wood objects, tie-dye shirts, and more. You do have to pay to do the projects, and the costs vary. One of my twins picked out a wooden fire engine to paint, and the other picked out a wooden airplane. They cost $5 each. It was the first time the boys painted something other than paper, and they were so proud of their creations. The boys also had fun playing at a quirky little playground outside the Craft and Design Center that includes a playhouse, swings, a really cool seesaw with four sides, and more. The main dining option at Estes Park Center is the Aspen Dining Room. That’s where you receive your free meals, if your stay includes them. The food is served cafeteria-style, and I have to say—it tastes like cafeteria food. After managing to scrape together a dinner there on our first evening, we decided to skip our free dinner the next night and go to a restaurant in downtown Estes Park. (There are some great restaurants there!) I can’t comment on the lunch offerings because we ate lunch in our rooms with food we bought at the local Safeway. The breakfasts, however, were actually decent and just what you’d expect—scrambled eggs, sausage links, bagels, muffins, assorted fruit, etc. We really can’t complain about our meals because they were free, and kids 5 and under always eat free. But we would not have minded paying the regular breakfast price of $8 per adult ($4 for kids ages 6-12). Lunch is $10 per adult and $6 per kid ages 6-12. Dinner is $14 per adult and $9 per kid ages 6 to 12—a price we would not have been happy to pay. It seems that many other visitors agree with us, because while breakfast was very crowded both mornings, there weren’t very many people at dinner. I imagine the large groups staying in the cabins prepare their own meals, and that other people eat at restaurants like we did. Note: Estes Park Center does have a fine-dining restaurant called the Pine Room, as well as a cafe that serves to-go meals. So there are other on-site food options, but we didn’t get a chance to try them. All in all, we had a wonderful stay at YMCA of the Rockies Estes Park Center. It is affordable, it’s in a great location, and there is lots for families to do—especially ones with older kids. It’s also a great place for big groups and a great deal for military families. You may just want to think about making alternate plans for lunch and dinner!